Meteors are what are often called “shooting stars”, although there could hardly be a greater contrast. Real stars are gigantic globes of gas that burn through nuclear reactions, whereas meteors are usually only tiny specks of dust! In that case, why are they called “shooting stars” and how is it that we can see them? Well it is down to the fact that they – and the Earth – are travelling very fast through space. As our planet speeds in its obit around the sun, it sometimes passes through clouds of dust which are leftover from the tails of comets. As these particles travel through the Earth’s atmosphere, friction makes them heat up. You can see this for yourself by rubbing your hands together – friction is what makes them feel warm, but you’ll only be rubbing them quite slowly – meteors can be travelling at several miles per second! As a result, the heat from the friction is so great that they burn up, and it’s the glow from their fiery destruction that makes them bright enough to be seen from the ground. As they speed across overhead – usually only taking a few seconds, they look like stars shooting across the sky – hence the name. Sometimes they are big enough to survive their journey through the atmosphere and the part that is left over and hits the Earth is called a meteorite. Occasionally there can be quite big meteorites, such as the one that caused the famous Meteor Crater in Arizona, or the even bigger one that crahed into the Earth 65 million years ago and wiped out the dinosaurs! There are several major meteor showers each year. These are times when we pass through a comet’s particle stream and for a few nights there are a fair number of meteors visible. The number various from one shower to another, and also from year to year. What you can see also depends on how dark the sky is and the glare from the Moon can make meteor watching quite poor. The meteor showers get their names from the constellation that lies in the direction from which they appear to come. This point is called the “radiant”, as they appear to radiate from that location. For example, the meteors in the main shower in November appear to come from the direction of the constellation of Leo, so they are called the Leonids. In fact they are nothing to do wth the constellations; that is simply the pattern of stars which lie in that particular direction at the time. How can we observe meteors? All that’s needed is to look up at the sky! Of course it’s useful to know from which direction the meteors are going to appear, but that doesn’t mean that it’s best to look in that direction. It can be better to look about 90º away from the radiant. A reclining chair – You want to be comfortable. An alternative would be a li-lo or something similar. A hat – a lot of heat loss from the body is through the head. A good pair of shoes or boots to keet your feet warm. Good thick socks, perhaps 2 pairs! Possibly a blanket to (a) insulate you from the chair and (b) to wrap over you, or a sleeping bag. Some nibbles to keep you going through the night! A torch – Make sure that you cover the end with red plastic or cellophane to prevent the brightness from ruining peoples’ night vision. How many meteors will I see? This can vary enormously. The table above gives the predicted Zenith Hourly Rate, but actual rates may well be lower than this. How can I take photos of meteors? There are two things to remember – meteor trails are faint, and you can’t guarrantee exactly when or where they will appear. So the best thing to do is to take a series of long exposures of the sky. To do this you need a digital camera – so you can take lots of pictures and then delete the ones that don’t show any meteors – which will be most of them! You will need to set the camera on a tripod or place it on something so that it is pointing in the required direction, and have it set to take long exposures. Most cameras will allow exposures of 30 seconds or more. Do watch out, though, as some need about the same length of time as the exposure to process the image before saving it. You also want to be able to start the exposure and not to have to hold the camera whilst the image is being captured, or you are likely to finish up with a very wobbly picture! Depending on the meteor rate, you may want to take one picture per minute or so, so you will probably need at least one extra set of batteries, especially so as batteries are affected by cold. 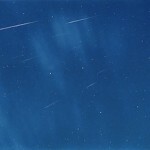 We can provide additional information on watching and photographing meteors when you book.